The best way to find a place to dine in Limoges is to wander in the several areas dedicated to restaurants and choose the one that appeals at the moment. The center of Limoges is easily walkable. Find your way to one of these café-restaurant areas and you'll find a good place for a drink, a snack or a meal. 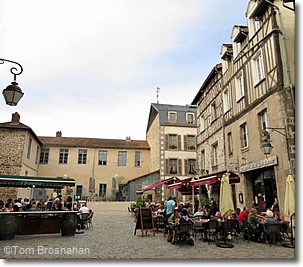 The Place de la République, the main square of Limoges, offers several café-restaurants with open-air seating. Choose your preferred seat by the position of sun and shade, or view. The oldest established place here, open early for breakfast until late in the evening, is the Café-Bar Le Central. The lower portion of Rue Charles Michels near Place Manigne is lined on both sides with café-bars and restaurants serving French, American, Japanese, Italian and international-fusion cuisine. In good weather, tables, seats and benches crowd the street and several hill terraces provide even more seating. It's a lively scene, with something for every taste. Near the Cathédrale Saint-Étienne in the historic La Cité quarter of the city on the shore of the River Vienne, the Rue Haute-Cité/Rue de la Providence has no vehicular traffic, just tables and chairs set out in a sort of square, filled with happy sippers and diners.